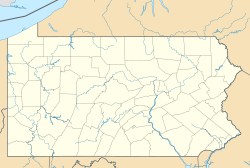 This article is about the village in Lehigh County, Pennsylvania. For the region in the U.S. state of Texas, see East Texas. East Texas is a village in Lower Macungie Township, Lehigh County, Pennsylvania. The Little Lehigh Creek forms its natural southern boundary. While the village has its own box post office with ZIP code of 18046, surrounding areas use the Allentown ZIP code of 18106 and the Macungie ZIP code of 18062. The community was named after the state of Texas (the name was prefixed with "East" in order to avoid repetition with another Texas in the state). Lower Macungie Elementary School is in the village while Lower Macungie Middle School is located just NW of it. ^ "East Texas". Geographic Names Information System. United States Geological Survey. ^ Moyer, Armond; Moyer, Winifred (1958). The origins of unusual place-names. Keystone Pub. Associates. p. 41. This page was last edited on 7 February 2019, at 21:35 (UTC).